ZIKA-4 LMn E-7018 Low Manganese Emission – Zika Industries Ltd.
Home Catalog Stick Electrodes Low Manganese Electrodes Line ZIKA-4 LMn E-7018 Low Manganese Emission – Zika Industries Ltd. Basic coated electrode Zika 7018 LMn has following features combination: low manganese emission fume, low moisture absorbance and low hydrogen basic coating. 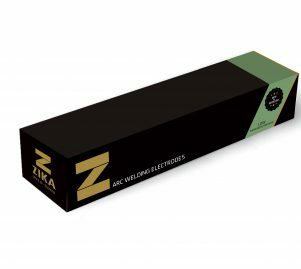 Zika 7018 LMn is reliable and high quality welding electrode, particularly suitable for welding of high strength low-alloy steels. Unique flux composition supplies weld metal with significantly lowered manganese content and therefore dramatically decreases the manganese emission in welding fume. This helps to meet requirements of environment regulation. Welding of general structural steels, fine-grained steels, boilerplates, pipe steels, and shipbuilding plates. Supplied in Vacuum pack, moisture absorbance by coating bellow 0.4 wt-% during 9 hours exposure to 80 %RH at 27 Cº.